Shatavari (Asparagus Racemosus) other names: Aheruballi, Asparagus, Asparagus Root, Asperge des Indes, Asperge Indienne, Asperge Sauvage, Asperges Racemosus, Chatavali, Espárrago Racemosus, Espárragos Racemosus, Indian Asparagus, Inli-chedi, Kairuwa, Majjigegadde, Narbodh, Norkanto, Philli-gaddalu, Satavari, Satawar, Satawari, Satmooli, Satmuli, Shatamuli, Shatavari, Shatmuli, Shimaishadavari, Sitawari, Toala-gaddalu, Wild Asparagus. Shatavari is usually found growing naturally in the Himalayas at altitudes of 1,400 meters, in the region of east of Kashmir. In western China, this herb is found growing in valleys at heights of 2,100 meters to 2,200 meters or in broad-leafed woodlands the length of streams. Shatavari is a member of the plant family Asparagaceae, the genus name of this herb being Asparagus. In addition to Racemosus, two other species adsendens and gonaclades are used for therapeutic purposes. More than 300 species comprise this plant family, which is distributed in various regions having tropical and temperate climatic conditions. Shatavari is an asparagus species found almost all over India, Sri Lanka and the Himalayan region. This herb grows to a height of one to two meters and has a preference for rocky soil with plenty of gravels. This plant is found growing at altitudes of 1,300 meters to 1,400 meters. The first botanical description of the plant dates back to 1799. As shatavari has numerous uses, the demand for this plant is increasing steadily. However, shatavari is now considered to be an "endangered" species even in its native habitat, primarily owing to obliteration of its habitat as well as rampant deforestation. Indigenous to India, some regions of China, Australia and Africa, shatavari is also called Indian asparagus. In fact, shatavari is one of the main herbs that is widely used in conventional Indian medical system. Shatavari is a climber and has a wooded stem, while the leaves of the herb bear resemblance to pine needles. The root of this herb is tuberous and, in terms of therapeutic properties, it is considered to be the most important part of this herb. Sometimes even the leaves as well as flowers of shatavari are used therapeutically. Ancient Ayurvedic texts suggest using shatavari for preventing as well as treating dyspepsia, gastric ulcers and also in the form of a galactogogue (a medicine that induces milk secretion). A number of Ayurvedic practitioners have also been using this herb for treating nervous disorders. 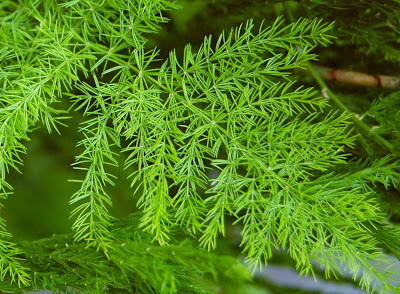 Shatavari bears small photosynthetic branches called phylloclades, which are akin to pine needles, uniform in structure and have a glossy green hue. The plant bears petite white blooms in July that appear on small, spiky stems. The fruits of shatavari are blackish-purple spherical berries that appear in September. Don’t confuse shatavari (asparagus racemosus) with asparagus officinalis, which is the type of asparagus that is commonly eaten as a vegetable. Shatavari can be grown easily in any fertile garden soil. This plant has a preference for fertile sandy, loamy soils. Shatavari does not possess the aptitude to endure frosts and should usually be grown in places free from frosts or where light frosts occur. The tubers of shatavari are dug out during autumn and stored in a cool place free from frosts, before they are replanted in spring. For therapeutic use, the roots of shatavari are usually gathered from the wild. In fact, excessive harvesting of the roots of this species in some regions has led to conservation concerns. Shatavari is a plant used in traditional Indian medicine. The root is used to make medicine. Women use shatavari for premenstrual syndrome (PMS) and uterine bleeding; and to start breast milk production. 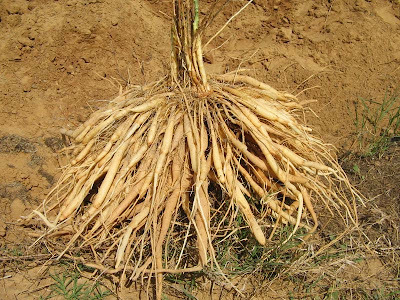 Shatavari (Asparagus Racemosus) is widely employed in traditional medicines. In the Ayurvedic medicine system, the roots of this herb are often prescribed for treating health conditions related to the stomach. This asparagus species is also given to women to augment breast milk production. While the herb’s effectiveness is yet to be ascertained by clinical trials, people have been using shatavari for several thousand years and there are anecdotal evidences that indicate that the use of this herb for therapeutic purposes is not only safe, but effective too. Various remedies are prepared from shatavari by pulverizing the dried out roots into a powdered form. Shatavari has several other therapeutic uses and shatavari is also employed for treating stomach problems. Often Ayurvedic practitioners and herbalists prescribe this herb for treating stomach ulcers. However, there is not much scientific evidence to show how this herb works to cure stomach ulcers. The root of shatavari is also employed to treat stomach-ache, indigestion and diarrhea. In addition, this herbal remedy may also help in getting rid of hangover and also be beneficial for the liver. Sometimes Ayurvedic practitioners also use shatavari for treading serious health problems like diabetes and dementia. However, thus far there is very little scientific evidence regarding the safety and efficacy of using this herb for these conditions. In fact, absence of clinical trials involving shatavari has made shatavari problematic for doctors in the West to recommend proper dosage of this herb. Shatavari may possibly interact with lithium and, hence, it should be avoided by people taking this drug. Perhaps, shatavari is best known as an herbal remedy that is rejuvenated for females. Shatavari has been found to be effective for treating conditions like decreased libido, infertility, risks of miscarriage, leucorrhea and even menopause. In addition, shatavari possesses the aptitude to maintain the pH balance in the region of the cervix. The demulcent action of this herb also helps to balance the humidity levels of dry membranes, for instance those present in the vaginal wall. This herb is also beneficial for women and is effective in treating impotence as well as common sexual impediments. Apart from being used to treat the problems associated with the reproductive organs, shatavari is also fairly effectual in treating diarrhea, hyperacidity, and stomach ulcers. Shatavari is also useful for soothing the dehydrated and aggravated membranes present in the upper respiratory tract, thereby making it a valuable remedy for chronic fevers and bronchitis. Moreover, shatavari is also believed to be helpful in sustaining the balance of the different fluids in the body. The rhizome of this herb works as a soothing tonic and has a positive affect on the digestive, circulatory, respiratory as well as the female reproductive organs. The tuberous roots of shatavari possess aphrodisiac, antispasmodic, alternative, diuretic, demulcent, refrigerant and galactogogue attributes. This tonic is taken orally for treating loss of libido, infertility, miscarriage risks, hyperacidity, bronchial infections, stomach ulcers and problems related to menopause. Shatavari is also used topically to treat joint stiffness. The fresh root of the herb is used for treating dysentery. The roots/ rhizomes are collected during autumn, dried out and stored for use when needed. The whole shatavari plant is employed for treating a variety of health conditions including diabetes, diarrhea, and problems related to the brain as well as rheumatism. Shatavari is also effective for cleansing and nourishing the blood as well as the female reproductive organs. As this herb provides several female hormones, shatavari is beneficial for menopausal women or women who have a history of hysterectomies. Shatavari or shatavari helps to nourish the ovum and, at the same time, improves fertility. This asparagus species is said to be effective in augmenting Sattva (which means positivity and curative power). In addition to improving awareness regarding spiritual love, shatavari also enhances Ojas (which means "vigour" in Sanskrit). Shatavari is useful for treating symptoms associated with PMS. Shatavari helps to alleviate pain and also regulate the loss of blood during menstruation. This asparagus species is also useful in alleviating menopausal symptoms like hot flashes. As the herb promotes estrogen production, shatavari compensates for the poor levels of estrogen in menopausal women or those who have endured oophorectomies (removal of one or more ovaries). As shatavari is effective in curing hyperacidity, it may be used on a regular basis in the form of a food supplement. A health drink can be prepared from the plant’s rhizome at home and consumed by all members of the family. In addition, you may regularly use the powder of the dried shatavari root (also known as Shatavari churna) in the form of a tonic. Some people use shatavari to ease alcohol withdrawal. The soft, young shoots of the herb are consumed as a vegetable after cooking. In fact, the flavour of a preserve made from the blanched shatavari roots is said to be very pleasant. The tubers of the herb are also candied in the form of a sweetmeat. The sole flavour of the tuber is akin to that of sugar. Apart from being used for therapeutic and food purposes, there are other uses of shatavari roots. For instance, the compressed root of the plant is employed for cleaning clothes. There is not enough information available to know if shatavari is safe. Although shatavari is generally considered to be safe for most people, some individuals who are sensitive to this herb may experience skin reactions and/ or pulmonary allergic reactions. In addition, people suffering from edema owing to any impaired heart function or a kidney disorder should keep away from shatavari. People using shatavari should also monitor their weight, as use of this herb may result to weight gain. Pregnancy and breast-feeding: Not enough is known about the use of shatavari during pregnancy and breast-feeding. Stay on the safe side and avoid use.